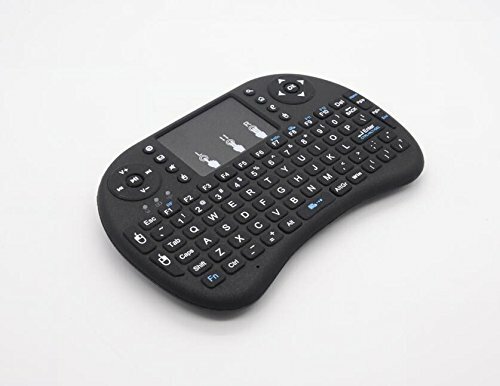 Mini wireless handheld keyboard compatible with Raspberry Pi, Smart TV, HTPC, XBMC, PC, laptop and most Google and Android set top boxes. No need to keep a full sized keyboard and mouse connected. Connects to your device via included 2.4 Ghz USB receiver. Stored inside the back cover of the keyboard, simply insert the USB receiver into an available USB slot on your device for wireless connection. The long lasting battery is rechargeable and will give you over 24 hours of use on one charge! Use it to easily input text, browse the internet and play games with a unified keyboard and remote. You never have to leave the couch! Mini wireless handheld keyboard compatible with Raspberry Pi, Smart TV, HTPC, XBMC, PC, laptop and most Google and Android set top boxes. No need to keep a full sized keyboard and mouse connected. Connects to your device via included 2.4 Ghz USB receiver. Stored inside the back cover of the keyboard, simply insert the USB receiver into an available USB slot on your device for wireless connection. The long lasting battery is rechargeable and will give you over 24 hours of use on one charge! Use it to easily input text, browse the internet and play games with a unified keyboard and remote. You never have to leave the couch! If you have any questions about this product by Pengaz, contact us by completing and submitting the form below. If you are looking for a specif part number, please include it with your message.